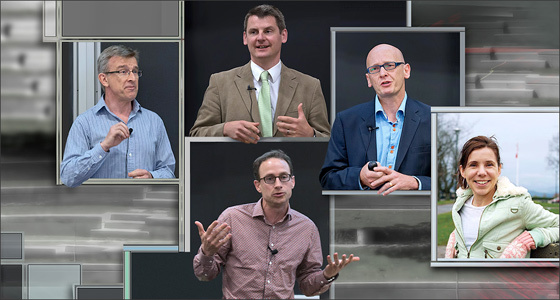 Clockwise from top: Simon Bates, Paul Cubbon, Celeste Leander, Fred Cutler, and Paul Carter will be part of the faculty nucleus leading the Flipped Lab. As part of the Flexible Learning Initiative, the Centre for Teaching, Learning and Technology (CTLT) will be supporting the establishment of the ‘Flipped Lab’ network, a faculty-led collaboration which will provide community support to discuss and develop effective and engaging flipped classroom approaches across UBC. The first workshop that will delve into some of the strategies, techniques, and tools that can support a flipped classroom will be held on July 30. Flipped classrooms aim to provide a more active learning experience in the classroom by exposing students to content and material before coming to class, freeing up class time for more demanding tasks than information transfer. The approach is used already at UBC in courses across several Faculties. The Carl Wieman Science Education Initiative, which started six years ago and aims to improve the way science courses are taught, has led to many “flips” of some kind in the Faculty of Science, for example. “There’s definitely a movement towards this within higher education, with people producing lots and lots of resources. Sometimes though, what you need is just to be able to make contact with people doing similar things in their classrooms and share advice and discuss common issues,” said Simon Bates, Senior Advisor, Teaching and Learning, Academic Director of CTLT, and Professor of Teaching in the Department of Physics and Astronomy, who came up with the idea of the Flipped Lab so that faculty members could workshop ideas and build connections with each other around this method. While there has been a lot of work done on flipped classrooms at UBC in the sciences and other disciplines, there is currently interest across all disciplines to experiment with the model, as evidenced by the flexible learning projects under development. With the recent call for proposals under the Flexible Learning Initiative, 19 projects fall under a flipped classroom umbrella. These projects aim to transform parts of or whole courses, and as many as 10,000 students will be impacted by these changes beginning in September 2013 and January 2014. While the Flipped Lab was created in part to help support these projects, it is open to any instructors or learning support staff who are curious about or are exploring the flipped classroom approach. The Flipped Lab learning community will be supported and led by a nucleus of instructors who have their own experiences and approaches that they can bring to bear in the workshops, which will be held every couple of months. These faculty members include Bates from CTLT and Physics, Paul Carter from Computer Science, Fred Cutler from Political Science, Paul Cubbon from the Sauder School of Business, and Celeste Leander from Botany.